On Twitter: @SenJohnMcCain: Theres nothing America First about taking the word of KGB colonel over US intelligence community. Public RSS-Feed of Mike Nova. Created with the PIXELMECHANICS ‘GPlusRSS-Webtool’ at http://gplusrss.com: 5:29 AM 11/11/2017 – Прошла любовь, завяли помидоры… And how about it?! 5:29 AM 11/11/2017 – Прошла любовь, завяли помидоры… And how about it?! It looks like the Russians are desperate for the high-level contact: it did not work out for Mr. Pu, maybe it will for Medvedev? This is a somewhat unusual circumstance: to send two leaders on a far foreign trip almost simultaneously. There must be a reason for it. Is the planned change in Russian leadership somewhere in sight for 2018, the year of the presidential elections in Russia? Does Putin plan not to run and to endorse Medvedev? Is there any deal in the works between the Russian and the U.S. intelligence circles about the change of leadership in Russia as a condition for improvement in relations and the reconsideration of sanctions which spell the economic and political demise of Russia as it is now? Blame it all on the old, half-demented Tzar, and send him into the well deserved and dignified retirement. Somewhat better and more humane than just to kill him. And then we’ll see, maybe he would want to travel to The Hague, or to some other interesting places, to attend some interesting meetings. No puppet master, no puppet. Or no the obvious, visible, and implied, “hard-wired” connection between them. The other, more complicated connections, of spying-cyber-virtual, and hard to find realm, are the completely different matter. MANILA, November 12. /TASS/. Russian Prime Minister Dmitry Medvedev and US President Donald Trump were standing next nearest to each other during the joint photo session before the gala dinner for ASEAN leaders attending the summit in Manila, a TASS correspondent reported on Sunday. The Russian prime minister was among the first to show up at the congress hall where the Philippines president organized the reception. Earlier in the day, Medvedev had a number of bilateral meetings. Trump, on the contrary, was the last to arrive at the reception, with his Philippines shirt pretty wrinkled. Before taking their seats at the dinner, the leaders, wearing Philippines national shirts Barong Tagalong, posed for a joint photo. Medvedev and Trump were standing next but one to each other, with only Vietnamese Prime Minister Nguen Xuan Phuc between them. Medvedev and Trump were also photographed shaking hands. After a speech by Philippines President Rodrigo Duterte, journalists were asked to leave. … by announcing that President Donald Trump wouldn’t formally meet with … argument with stand-in President Dmitri Medvedev over the Western … It can work: In the Philippines, President Rodrigo Duterte is a Putin admirer. MANILA (Reuters) – U.S. President Donald Trump landed in the Philippines on Sunday for a summit of Southeast and East Asian nations, hours after offering to mediate on competing claims to the South China Sea that have long stoked tensions in the region. It will be the last leg of a marathon Asia tour that, despite Trump’s “America First” policy, may reassure some that his administration remains committed to a region that Beijing sees as its strategic domain. Trump is expected to try during the summit to shore up relations, which have been strained by the mercurial Duterte’s notorious anti-U.S. sentiment and his enthusiasm for better ties with Russia and China. Police used water canon to prevent hundreds of protesters reaching the U.S. embassy in Manila ahead of Trump’s arrival. Carrying placards declaring “Dump Trump” and “Down with U.S. Imperialism”, the left-wing protesters were blocked by police in riot gear with shields and batons, and then showered with jets of water from a fire engine. On a tour that has taken him to Japan, South Korea, China and Vietnam, Trump and his team have repeatedly used the term “Indo-Pacific” instead of “Asia-Pacific” for the region, which some see as an effort to depict it as more than China-dominated. 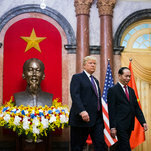 Pacific Rim nation leaders agreed in Vietnam on Saturday to address “unfair trade practices” and “market distorting subsidies”, a statement that bore the imprint of Trump’s efforts to reshape the global trade landscape. The summit of Asia-Pacific Economic Cooperation (APEC) countries in Vietnam put on show the contrasting vision of the “America First” policy with the traditional consensus favoring multinational deals that China now seeks to champion. Leaders at the Philippines summit will discuss the South China Sea, but mainly to agree on a procedural step to cool tensions. In August, foreign ministers of Southeast Asia and China adopted a negotiating framework for a code of conduct in the resource-rich waterway, a move they hailed as progress but one seen by critics as a tactic to buy China time to consolidate its power. The framework seeks to advance a 2002 Declaration of Conduct (DOC) of Parties in the South China Sea. The DOC has mostly been ignored by claimant states, particularly China, which has built seven man-made islands in disputed waters, three of them equipped with runways, surface-to-air missiles and radars. The framework will be endorsed by China and the 10-member Association of Southeast Asian Nations (ASEAN) on Monday, a diplomat from one of the regional bloc’s countries said. 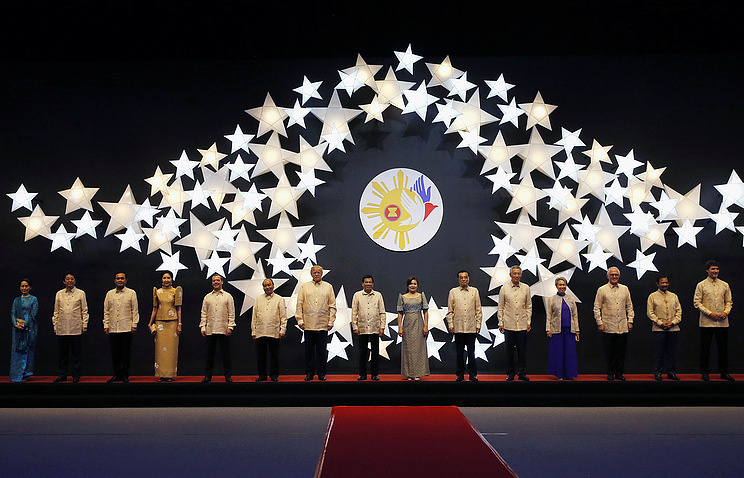 Others who will be in Manila for the summit meetings include Chinese Premier Li Keqiang, Russian Prime Minister Dmitry Medvedev and leaders from Japan, Canada, South Korea, India, Australia and New Zealand. Премьер-министр России Дмитрий Медведев прибыл на церемонию встречи главы делегаций АСЕАН с президентом Филиппин Родриго Дутерте, следом за ним на церемонию пришел президент США Дональд Трамп, передает РИА «Новости». Дутерте встретил лидеров вместе со своей супругой Сьелито Авансенье. Во время церемонии фотографирования между Трампом и Медведевым стоял премьер-министр Вьетнама Нгуен Суан Фука. Ранее сообщалось, что в Маниле заявили о желании России назначить военного атташе на Филиппинах. The Secrets Of The Black Briefcase | Question: Why do we have all these problems with the counter-terrorism and the counterintelligence? Donald Trump’s hand picked CIA Director Mike Pompeo has long come off as being one of Trump’s most personally loyal allies. Pompeo has publicly claimed in the past that Russian interference in the election was far less significant than what the rest of the US intelligence community has asserted. Even as recently as last week, Trump and Pompeo were reportedly conspiring to run interference aimed at protecting Trump from his Russia scandal. But as of today, Pompeo is clearly had enough of the antics – and he’s speaking out publicly in direct defiance of Trump. Earlier today, Donald Trump announced that he believes Russian President Vladimir Putin’s claim that Russia did not interfere in the election. This sent immediate shockwaves across America, causing “Putin” to immediately become the top trending topic on Twitter. Numerous current and former government officials quickly lashed out at Trump for the remark, or sought to directly dispute Trump’s assertion. Shockingly, Mike Pompeo was among those voices. Here’s how NBC news reporter Andrea Mitchell characterized what Mike Pompeo said: “Wow! CIA Director Mike Pompeo releases statement endorsing intel conclusion Russia meddled direct challenge to Donald Trump’s comments accepting Putin denial and calling ex CIS officials political hacks.” Mitchell’s surprise is warranted, as Pompeo is now clearly trying to distance himself from the entire Trump-Russia mess, and in effect distance himself from Donald Trump entirely. It raises the question of what’s suddenly going on here. Mike Pompeo is not known to have been a participant in the Trump-Russia election rigging scandal. However, his consistent attempts at covering for Trump in the scandal have made him look incredibly guilty. Perhaps he’s now come to the conclusion that he’s tired of getting dragged deeper into this mess. Perhaps he fears getting caught up the investigation. Or perhaps Mike Pompeo concluded today that Donald Trump is a goner after the Putin remarks, and he’s now hoping to hang onto his CIA job under the next president. The post CIA Director Mike Pompeo has had enough, speaks out in direct defiance of Donald Trumpappeared first on Palmer Report. … and a shot of Mr. Trump giving a thumbs up and promoting rallies in Florida. … and an endorsement of the Black Panthers as fighters against the Ku Klux Klan. … and a yellow “No Invaders Allowed” sign posted at the United States border. … and Stop All Invaders. … while Being Patriotic suggested that Black Lives Matter activists were killing police officers. How do you run a political campaign that successfully tips the scale in the favor of your candidate? Run lots of advertisements, ones that portray your candidate in a legitimately human light, establish his or her stance on vital issues and projects them as a trustworthy potential leader of the nation. From time to time, a good ol’ smear campaign that cries foul on your opponents weaknesses is also helpful. At least, that’s what the experts tell me. Take one look at some of the advertisements purchased by the Russian propaganda machine on platforms like Facebook, Twitter and Google to sabotage the presidential race, however, and you will see just how different they are from any successful political campaign any candidate in this democracy has ever run. There is a picture of Jesus Christ arm-wrestling an #ImWithHer Satan in an attempt to prevent Hillary Clinton from winning the election. There is a meme about Bernie Sanders calling out the Clinton Foundation on corruption charges. There is an advertisement for a fake event being held in an attempt to allow Texas to secede from the United States. And of course, the weirdest of them all, a campaign promoting a coloring book of Bernie Sanders in hilarious muscular poses as an LGBT superhero. Some of these ads performed poorly, while others boasted click-through rates that were abnormally high and oddly successful. One thing that always remained the same, however, is just how weird these advertisements were. If this was an attempt to hack a democratic election, it was abnormally bizarre. It’s easy to dismiss these campaigns as nothing more than a joke, but the very fact that they reached millions of viewers across the nation proves just how effective they were. Experts, however, say that the fact that these campaigns were so abnormal and funny was exactly the reason why they were so successful. In a new report released by the Harvard University’s Shorenstein Center, authors James Carey and Claire Wardle tell us that the best way to reach a huge audience on a social media platform is to involve as much drama as possible. According to these researchers, advertisements purchased by the foreign propaganda machine were targeted towards a narrow strip of swing voters who weren’t sure which way to lean come election time. The advertisements, despite their initial lack of seriousness, helped confirm for these people their predisposed biases and gave them reason enough to pick one among two opposing candidates both of whom they largely disliked. Better Trump than Hillary, that was the motto of this campaign. Donald Trump may not be perfect, but he is still an outsider, and therefore times better than an establishment-loving Hillary Clinton. You keep hammering this idea into someone’s head long enough, and they will eventually give in. The propaganda machine ran a very sophisticated social media campaign that depended on the human race’s most basic impulses in an attempt to influence their behavior. Hillary Rotten Clinton. Hillary the Satan. Killary with a K. These ideas were repeatedly hammered into people’s heads as a means to manipulate them on a subconscious level. They may not have agreed with these ads when they saw them, but keep encountering them time after time and they’ll eventually form a subconscious idea that anyone is better than Hillary Clinton. And that, my friends, is how a fiercely hated foreign power with no standing in our nation managed to manipulate our democracy and coerce our wills without us even knowing it. President Donald Trump will not meet formally with Russian President Vladimir Putin at an Asia-Pacific summit in Vietnam this week due to a scheduling conflict, the White House said Friday, amid U.S. concerns that the meeting wouldn’t create genuine progress on key issues. Any Putin-Trump meeting would be fraught with political complications for Trump, as his campaign and his administration face investigations over ties to the Russian government during the 2016 presidential campaign. Those probes have been heating up in recent weeks, with charges filed against Trump’s former campaign manager and a foreign policy campaign aide. Kremlin spokesman Dmitry Peskov told Bloomberg that consultations are continuing. “There is no final understanding yet,” he said. The Kremlin had announced that both sides were working on a suitable time and format for a meeting when both men are in Vietnam, without specifying if it’d be a formal sit-down. But U.S. Secretary of State Rex Tillerson had downplayed the possibility in an interview on his flight from China to Vietnam, saying there was no point meeting if there wasn’t the likelihood they’d make progress on a number of issues. The news came a day after Trump met with Chinese President Xi Jinping over many of the same questions he would have discussed with Putin, notably how to rein in North Korea’s nuclear ambitions. Xi had offered Trump few concrete proposals and little beyond well-worn phrases about the importance of denuclearizing the Korean peninsula. Both Russia and China oppose moves that would cause Kim Jong Un’s regime to collapse, and have called on both North Korea and the U.S. to lower tensions and start talks. While the Kremlin had said it expected the meeting to happen, and Trump himself told reporters aboard Air Force One that a sit-down was likely, Tillerson insisted Thursday the meeting would only occur if there was “sufficient substance” to necessitate gathering. “We’d like to know if the two heads of state are going to meet there’s something useful to point to,” Tillerson told reporters in Beijing. He insisted there had not been an agreement for a formal meeting, but said it could be useful if concrete progress on the “significant conversations underway” between the U.S. and Russia on a range of foreign policy issues could be accomplished. That could include efforts on North Korea, as well as the ongoing crises in Syria and Ukraine. Any meeting between Trump and Putin could carry a political cost for the U.S. president. Recent weeks have featured a flood of difficult stories for the White House, including revelations earlier this week in the New York Times that Commerce Secretary Wilbur Ross had failed to disclose business ties to Putin associates. Ross told Bloomberg Television that he will “probably not” maintain his stake, worth up to $10 million, in shipping company Navigator Holdings Ltd., whose clients include a Russian energy company owned partially by Putin’s son-in-law as well as an oligarch who has been sanctioned by the U.S. government. “I’ve been actually selling it anyway, but that isn’t because of this,” Ross said Monday. A meeting would also follow the decision by Trump campaign foreign policy adviser George Papadopoulos to plead guilty last week to lying to the FBI about his attempts to organize a meeting between campaign staff and Russian officials. The investigation into Russian interference in the election has also already ensnared Paul Manafort, the president’s former campaign chairman, who is accused of crimes stemming from his lobbying and consulting work for pro-Russian interests in Ukraine. Critics of the U.S. president accuse the White House of slow-walking new sanctions against Russia imposed by Congress, which wanted to signal its displeasure with Russian interference in the 2016 election. This week top U.S. technology companies, including Facebook Inc., Twitter Inc., and Google Inc. disclosed that Russia had distributed mass propaganda over their social media networks during the election. President Donald Trump and Russian President Vladimir Putin met on the sidelines of the Asia-Pacific Economic Cooperation Summit (APEC) in Vietnam Saturday, according to the White House. The final channel is the efforts by Cambridge Analytica, the campaign’s data firm. 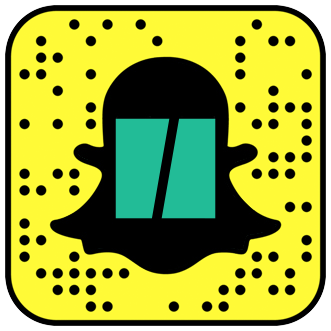 This channel is less well known to the public, in part because reporting about it has been dominated by The Wall Street Journal, and its stories hidden behind a paywall. 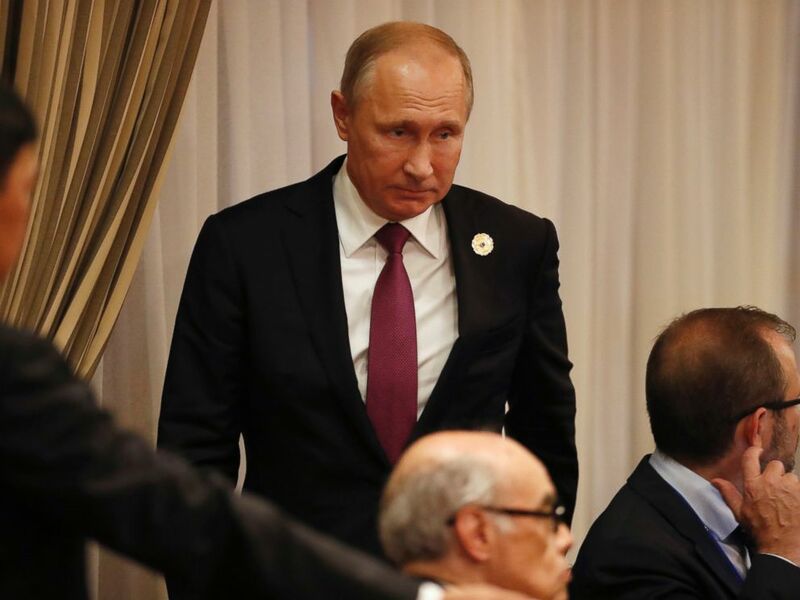 DANANG, Vietnam — Talks between Donald Trump and Vladimir Putin, a much-anticipated box office event at an Asia-Pacific summit, were up in the air Saturday as the leaders swapped warm greetings in Vietnam but kept the world guessing on a formal meeting. Two days ago we got word that Special Counsel Robert Mueller had quietly interviewed Donald Trump’s White House senior adviser Stephen Miller before the start of the Asia trip. Yesterday we got word that Miller was the unnamed “senior policy adviser” mentioned in the confession of Trump campaign adviser George Papadopoulos. Now comes a report that Stephen Miller’s resignation may be imminent. First came the surprising word on Thursday from CNN that Mueller had interviewed Miller at least a week earlier. This was notable because the media had previously believed that Mueller’s first interview with a current Trump White House senior adviser would be with Hope Hicks, and that it would take place after the Asia trip. This prompted Palmer Report to point out that Mueller clearly knew something about Miller the the rest of us didn’t, though it wasn’t yet clear what it was (link). Then came the even more surprising revelation on Friday from the New York Times that Miller was aware of at least portions of Papadopoulos’ Russian conspiracy plot at the time (link). Now here comes the stunning part. Late on Friday night, Democratic Coalition co-founder and MSNBC guest commentator Scott Dworkin tweeted that “3 different GOPers told me tonight that we should expect Stephen Miller to resign next week, possibly as early as tomorrow” (link). Donald Trump tweeted a photo of himself and Miller aboard Air Force One earlier this week, confirming that Miller is on the Asia trip. This would mean that Miller could resign before the trip is even finished. One possible explanation for this could be that Trump didn’t know Stephen Miller had met with Robert Mueller, and now that it’s surfaced in the media, things have immediately gone sour between the two of them. There are other possible explanations. Now we wait to see what happens next. 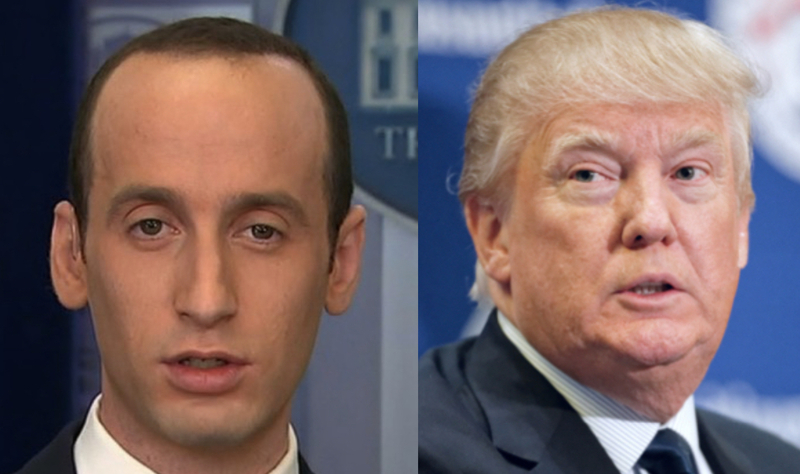 The post Report: Stephen Miller’s resignation may be imminent appeared first on Palmer Report. Robert Mueller just targeted Stephen Miller. Now comes word that Miller may exit stage left. “The ultimate question Mueller is after is whether candidate Trump and then President-electTrump knew of the discussions going on with Russia, and who approved or even directed them,” one source told Reuters. “That is still just a question.”. There are several channels through which Donald Trump’s campaign apparently cooperated with Russian efforts to help him win the presidency. The first, and best known, is a Trump Tower meeting in June 2016 to pursue Russian promises of providing dirt on Hillary Clinton. A second is Roger Stone, a frequent Trump adviser who had clear advance notice of the publication of stolen emails. A third is Trump himself openly asking Russia to obtain Clinton’s State Department emails. The final channel is the efforts by Cambridge Analytica, the campaign’s data firm. This channel is less well known to the public, in part because reporting about it has been dominated by The Wall Street Journal, and its stories hidden behind a paywall. But Cambridge Analytica’s role has come into much clearer focus. Two weeks ago, the Journal reported that Alexander Nix, the CEO of Cambridge Analytica, reached out to WikiLeaks founder Julian Assange to help him better organize the stolen Democratic emails his site was publishing. On Friday, the Journal found that this contact came as Cambridge Analytica was joining the Trump campaign. Nix denies the allegation: “We did not work with Russia in this election, and moreover we would never work with a third-party state actor in another country’s campaign.” But Nix also denies Russia had anything to do with the campaign at all. (“On Thursday, Mr. Nix called the notion that Russians “significantly interfered” in the U.S. election “frankly absurd,” the Journal notes.) That second denial, which is silly, saps the other denials of some of their credibility. Perhaps Cambridge Analytica would defend itself on the grounds that it didn’t know, in June of 2016, that the WikiLeaks emails had been stolen by Russia. But other reporting suggests the firm knew this very well. Flynn also worked as a consultant to Cambridge Analytica — a fact he failed to disclose until this last August. We don’t have proof that all these figures were acting together. But it certainly appears that Cambridge Analytica was heavily involved with trying to get Clinton’s stolen emails, and was aware that Russia had engineered their theft, and played an important role facilitating cooperation between Russia and the Trump campaign. Forget what Vladimir Putin says—the case that Russia directly coordinated with the Trump campaign to affect the outcome of the 2016 election has grown an order of magnitude stronger since last November. From Jared Kushner’s efforts to establish a covert communication channel with the Kremlin immune from U.S. monitoring, to Special Counsel Robert Mueller’s indictment of former campaign chairman Paul Manafort, the headlines all tell the same story: Numerous campaign and administration officials want to conceal their extensive connections to Russia. But obtaining testimony from Trump campaign officials is only half of the picture. There are other individuals deep within the Russian intelligence services and in President Putin’s inner circle who would definitively know the answers to questions of collusion. So how can we find these individuals and discover the smoking gun, should one exist? The answer involves an examination of dark days in the history of the FBI and CIA’s struggle against the Soviet Union, and raises important questions about these agencies’ ability to operate free from political pressure from the Trump White House. On August 18, 1986, a payphone rang in a shopping center in Springfield, Virginia. The man answering was Alexander Fefelov, a KGB technical officer assigned to the Soviet Embassy in Washington. The caller was one of the KGB’s most valuable assets in the U.S. government. The KGB referred to him as “B” because they did not know his true identity, though he had been in contact with them since October 1985. For reasons unclear, Fefelov made a fateful decision to record the call that day. Eight years later, the FBI arrested CIA officer Aldrich Ames, who confessed to selling secrets to the Russians beginning in 1985. Ames’ treason resulted in the deaths of numerous Russians who had cooperated with the U.S. However, both agencies quickly realized that Ames alone could not have been responsible for all of the compromises. Desperate to find evidence that would identify the remaining mole, both the FBI and CIA agreed to a crude tactic called “cold pitching.” It involved identifying former and current Russian intelligence officers around the world and offering them $1 million to talk. Dozens of Russians were approached and declined to cooperate, but the effort finally paid off when FBI agent Mike Rochford lured a Russian officer to the United States under the guise of a business deal. After two weeks of trying, Rochford convinced the man to help find the mole in exchange for money and resettlement in the United States. As it turned out, the Russian had access to the entire file on B, and CIA officers quickly devised a plan to smuggle it out of Russia. However, the man missed his planned rendezvous with the CIA. Rochford feared the worst, but the man surfaced in a third country, having successfully exfiltrated himself and the file out of Moscow. The file included every communication B had sent to the Russians. It contained maps of “dead drop” sites, locations where money and documents were exchanged between B and the KGB. There was no name[JW1] , but for the first time, the FBI had direct, non-circumstantial evidence that a second traitor existed. The effort to find a smoking gun on Hanssen consumed 14 years and significant resources. Could a similar effort be successful today? The Manafort indictment shows Mueller’s investigation is doing all it can to gain cooperation from U.S. persons. The CIA must similarly work to entice Russians with information to come forward, exactly as it has done in the past. Such an effort would be exceedingly difficult, as the circle of Russians with knowledge is certainly small and likely not allowed to travel abroad. Success would require support from senior CIA leadership. It is difficult to imagine CIA director and Trump loyalist Mike Pompeo approving operational activity of this nature that could ultimately implicate his boss. On the contrary, he seems intent on undermining the intelligence community’s conclusions on Russian interference, as evidenced by his recent meeting with a conspiracy theorist who claims Russia didn’t hack the Democratic National Committee’s emails. It is less difficult to imagine President Trump’s infuriated response to learning of the existence of such operations. But most importantly, what Russian source could actually trust that the full weight of the U.S. government is committed to his or her safety? This last point is worth dwelling on. Last year, shortly after the U.S. intelligence community released its findings, a high-ranking Russian cyber intelligence officer was arrested and accused of cooperating with the CIA. Whether the accusation was true not, Putin made clear the consequences of even being suspected of talking to the CIA about election hacking. And Russian officials undoubtedly got the message. With Pompeo’s objectivity compromised, the House and Senate Intelligence Committees play an increasingly vital oversight role to ensure our intelligence agencies are operating effectively. While it is not the role of oversight to directly propose or approve operational activity, the committees must ensure that Pompeo doesn’t stand in the way of any CIA operations, like the one that caught Hanssen, that are intended to pursue individuals with intelligence on Russia’s compromise of our election. Additionally, they must ask pointed questions about the agency’s preparedness to deal with an unexpected Russian defector who approaches the CIA with information. What would be the chain of custody for such information? How would the CIA assess the trustworthiness of the source? How would the resulting intelligence be disseminated to Congress? Would the president be briefed? The committees might even consider asking Pompeo to recuse himself from such operational decisions, due to his obvious conflicts. These questions require answers. Our country was attacked, and there is strong circumstantial evidence that Russia had help within the United States. Neither committee should conclude its investigation until they know that no effort has been spared to find a smoking gun, or can confidently conclude that there isn’t one to find. Joel Willett served 5 years in the CIA’s Directorate of Operations, including a year on the National Security Council at the White House. Prior to the CIA, he served in the U.S. Army and lived and worked in Moscow. He has an MBA from the University of Chicago and is a member of the Truman National Security Project’s Defense Council. Public RSS-Feed of Mike Nova. Created with the PIXELMECHANICS ‘GPlusRSS-Webtool’ at http://gplusrss.com: 6:27 PM 11/10/2017 С Президентом США Дональдом Трампом. Public RSS-Feed of Mike Nova. Created with the PIXELMECHANICS ‘GPlusRSS-Webtool’ at http://gplusrss.com: 6:14 PM 11/10/2017 What to Make of the Latest Story About Flynn and Gulen? 6:14 PM 11/10/2017 What to Make of the Latest Story About Flynn and Gulen? Saved Stories – None: What to Make of the Latest Story About Flynn and Gulen? The Wall Street Journal has another major story today regarding disgraced former National Security Advisor Michael Flynn. Reportedly, Special Counsel Robert Mueller is now investigating allegations that both Flynn and his son, Michael Flynn Jr., plotted to either kidnap and render Turkish clerk Fethullah Gulen to Turkey or to use Flynns influence as National Security Advisor to effectuate his extraditionall in exchange for up to $15 million. Its a very big story, one that casts the larger Flynn investigation in an altogether different, and more menacing, light, and one that also potentially casts the obstruction of justice investigation of President Donald Trump in a different light. Today, we put together a Special Edition of the Lawfare Podcast on the subject, featuring Shane Harris (one of the Journal reporters who broke the story), Turkey expert Ryan Evans, editor of War on Rocks, and Lawfare contributors Steve Vladeck and Paul Rosenzweig. In this post, we try to unpack some of the storys legal and political significance for Lawfare readers. First, while stunning, this allegation is not entirely new. The Wall Street Journal and other outlets have previously reported on a September meeting between Flynn and Turkish officials in which they discussed possibilities for removing Flynn from the United States. Former CIA Director James Woolsey attended that meeting and was so disturbed by what he heard that he contacted then-Vice President Joe Biden through an intermediary to report the matter. Woosley has made some public statements about the episode. Third, that this December meeting apparently focused on a more developed plan than what was discussed in September, including discussions of the possibility of transporting Mr. Gulen by private jet to the Turkish prison island of Imrali and a proposal to pay Flynn and his son up to $15 million for successfully delivering Gulen by one means or another. In other words, the import of the new Wall Street Journal story is the news that the special counsel is investigating whether, during the presidential transition, the incoming national security advisorwhile acting as unregistered agent of a foreign governmentwas also plotting a kidnapping on behalf of that foreign power. There have been media reports over the past several weeks regarding possible indictments against Michael Flynn and his son. NBC recently reported that Muellers team believe it has enough evidence against the pair to seek an indictment. And sources familiar with the Flynn family have revealed that both the elder Flynn and his wife are especially worried about the possibility of their son facing serious legal jeopardy. Both the fact that a public indictment has not yet materialized and Flynns concern for his son have lead to speculation that he might choose to cooperate with Muellers investigation in exchange for a dealor, in the alternative, that the Mueller camp is busily pressuring him now to do so. Previously, most analysts seemed to be assuming that possible indictments for Flynn would relate to his failure to disclose income and information on his security clearance forms and elsewhere as required, possible false statements to investigators, and for failure to register as a foreign agent as required by the Foreign Agents Registration Act (FARA). Those are all serious matters on their own. But the latest allegations open up a whole new ballpark of possibilities. The Journal story is ambiguous as to what the plot actually was and the manner and time in which it might be executed. On the one hand, discussion of putting someone on a private jet in exchange for $15 million would indicate the Flynns were not discussing using legal processes here. There is a word in the English language lexicon for forcibly putting someone on a plane against his will outside of the legal systems that allow compulsion and seizure of persons: The word is kidnapping and it is an extremely serious offense. The federal kidnapping statute is at 18 USC 1201 and the laws of Pennsylvaniawhere Gulen liveswould presumably have something to say about aspects of the plot (assuming the facts as reported by the Journal are true) as well. Flynn was a private individuala campaign advisorat the September meeting, and in the transition period during which the December meeting took place, he was a designated government official who had not yet assumed office. When government officials act or conspire to transfer someone, against their will and not pursuant to regular legal process, to a foreign jurisdiction, that is often described as extraordinary rendition. Prior administrations have acknowledged the use of the practice with respect to foreigners captured overseas. Even then, it is extremely controversial. As applied to a domestic person outside of traditional legal processes, it is simply criminalunder all imaginable circumstances. Plotting to do it, is a conspiracy to kidnap. The Journal is, as we say, ambiguous about means. In some passages, it suggests a kidnapping; in others, it suggests that Flynn would use his position as national security advisor to return Gulen by legal means. The U.S. and Turkey do have an extradition treaty. The Department of Justice has so far rebuffed Turkish extradition requests related to their claims that Gulen is the mastermind behind a 2015 failed coup attempt. But perhaps Flynn only agreed that he would use his influence to mount pressure on the Justice Department to use legal methods. And perhaps Flynn might argue that he was doing the President-elects bidding, attempting to reset relations with Turkey by removing a major irritant in those relations. That answer might get Flynn out of some legal hot water, but unless the facts in the Journal story dont pan out, there are still big problems. For one thing, theres still the allegation about money. Its no more legal to take $15 million to use your influence as national security advisor to bring about an outcome than it is to kidnap someone. Moreover, this version of the story would actually raise troubling issues about political influence on law enforcement. While the United States and Turkey do have an extradition treaty, the extradition process is designed to insulate against politically motivated decision-making as to peoples fatesprecisely what appears to have been contemplated here. Career DOJ officials, not the national security advisor, determine whether a requesting country has satisfied the terms of the treaty and provided a sufficient evidentiary basis to proceed with the request. That is especially important in situations like this one, where there is strong suspicion that the charges against Gulen are politically-motivated and that he will not be afforded protections of due process if returned to Turkey. If Flynn planned to subvert or improperly influence the extradition process for political aims, much less for money, that is a serious problem in and of itself. 18 U.S.C. § 219, goes one important step further [than the rest of FARA], making it a crime for any individual who is an officer or employee or person acting for or on behalf of the United States, or any department, agency, or branch of Government thereof, including the District of Columbia, in any official function, to be or to act as an agent of a foreign principal under FARA. Flynn would be barred from continuing to act as a foreign agent after January 20, when he took office, and that offense (a felony) would not be able to be remediedas Flynn has sought to do previouslywith retroactive filings. Finally, theres the matter of what all of this means for President Trump, who famously asked then-FBI Director James Comey to back off of the Flynn investigation in the period before he then fired Comey. This request has always represented a grave matter, particularly in the context of President Trumps larger set of interactions with law enforcement over time. It was, after all, a profound violation of the principle that the President does not direct law enforcement on investigative matters. It is, however, a far graver matter to the extent the investigation of Flynn involved potentially violent felonies. If Flynn is really suspected of involvement in a kidnapping plot, the question of what the President knew and when he knew it goes from being merely important to being acutely crucial. The public needs to know what precisely President Trump was asking his FBI director when he said to him: I hope you can see your way clear to letting this go, to letting Flynn go. He is a good guy. I hope you can let this go. Why do we have all these problems with the counterterrorism and the counterintelligence? In a stream of tweets, he called those raising questions about Russia haters and fools and said he could call North Koreas leader short and fat. Based on his own words, Donald Trump had enough of Jeff Sessions a long time ago. The only reason Sessions still has a job is that the Republicans in the Senate have been trying to protect their former colleague, while the Democrats in the Senate have been fearful that the ouster of Sessions could lead to the ouster of Special Counsel Robert Mueller. This week, as Sessions began to look more guilty than ever in the Trump-Russia scandal, everyone in Congress seemed to signal that theyre no longer interested in protecting him. Accordingly, Trump just made a major move aimed at crippling Sessions and pushing him out the door.When Jeff Sessions moved from the Senate to the Attorney General position, Donald Trump hired Sessions long time Chief of Staff Rick Dearborn to a senior White House position. Dearborn has been one of the relatively few senior White House advisors whose job seemed safe, even as other advisors have come and gone en masse this year. However, according to a new Politico report, Rick Dearborn is being pushed out of the White House and reassigned to a much lower level position in the administration (link). This is a clear attempt at weakening and angering Jeff sessions, as Dearborn was Sessions man in the White House. It could also be interpreted as Trump no longer trusting Sessions, and therefore not wanting sessions to have eyes and ears inside the White House. While its clear that Trump is now trying to force Sessions out of a job, it also raises another intriguing question. Does Donald Trump believe that Jeff Sessions may have already secretly cut a deal with Robert Mueller? If so, it would explain why Trump is choosing now to try to shove Sessions out the back door. In any case, the Democrats in Congress are now aggressively trying to get rid of Sessions, which means theyve concluded that Muellers job security is now safe. They appear to know something we dont. Stay tuned. The post Donald Trump makes major new move to cripple Jeff Sessions Srssions appeared first on Palmer Report. Donald Trump’s hand picked CIA Director Mike Pompeo has long come off as being one of Trump’s most personally loyal allies. Pompeo has publicly claimed in the past that Russian interference in the election was far less significant than what the rest of the US intelligence community has asserted. Even as recently as last week, Trump and Pompeo were reportedly conspiring to run interference aimed at protecting Trump from his Russia scandal. But as of today, Pompeo is clearly had enough of the antics and he’s speaking out publicly in direct defiance of Trump.Earlier today, Donald Trump announced that he believes Russian President Vladimir Putin’s claim that Russia did not interfere in the election. This sent immediate shockwaves across America, causing “Putin” to immediately become the top trending topic on Twitter. Numerous current and former government officials quickly lashed out at Trump for the remark, or sought to directly dispute Trump’s assertion. Shockingly, Mike Pompeo was among those voices.